To start out, here’s a couple of author names to remember. Takumi Miyajima: She wrote the scenario for the game and the draft scenario (and some side events) for DotNW. From what I understand her first foray into the Tales series was working on skits for ToD 2. 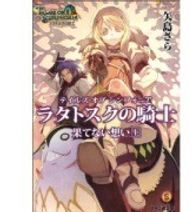 She also wrote the scenario for Tales of the Abyss and has been involved in most of the side materials relating to it. Ryunosuke Kingetsu: Handled the series composition for the OVA. He also wrote the Scenario for the ToP OVA (which is wildly inconsistent with the game in terms of worldbuilding, but that’s another essay). He’s been involved with the Tales series for a long time, usually in writing side materials. He has been involved with writing Novels and/or Audio Dramas for Phantasia, Eternia, Destiny, Rebirth, Tempest, Innocence, and Abyss. A novelized version of DotNW. Published in 2008. They were written by Sara Yajima and illustrated by Daigo Okumura. Sebz has uploaded scans of each of these. Published in 2010, same creative as above. 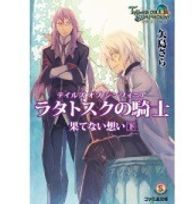 This novel is about Aster and Richter, Colette waiting for Lloyd after he ran off to play Batman, and a few other stories.Sebz has uploaded the book. Published in 2010, same team as above. This novel is about Alice and Decus’ meeting and relationship pregame. It seems to be mainly centered around Alice? Going off the summary at least. Published 2013, authored by Takumi Miyajima. This is the novel that came with the Lalabit edition of the game. It is also going to be localized and distributed globally by Namco with the Collector’s Editions of the game. It’s mainly about what the characters are up to pre-DotNW. The only significant thing that comes up in it that I’m aware of is that Aster’s last name is レイカー/Laker. Saku scanned the pictures.